So, a big part of my being-stuck problem on the RSWIP (Romantic Suspense Work In Progress) was not really having an antagonist, which meant my characters were just wandering around bickering for no reason without any escalation of stakes. They had lots of problems, of course, just not the kind of antagonist-driven conflict that makes things, you know… interesting. 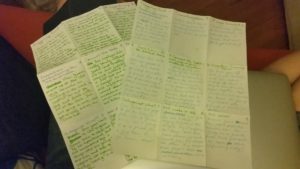 I found that it helped to do some outlining – but it also clarified that my lack of antagonist clarity was a big problem. So I did it again! I treated the antagonist as if she were the protagonist (don’t most antags think they’re the protag anyway?) and went through the same steps. This was really helpful at showing me where my antagonist was doing things that made sense for her (Act I) and where she wasn’t (uh…. Acts II and III), and helped me think about whether my antagonist WAS my antagonist, or whether she was a minion (still not 100% sure, even though I’m calling her my antag now). I’m not sure I have many answers, but I think at least now I know the right questions to ask next time my writing partner and I get together. I’m also a little bit tempted to give my antag a POV – or to write it as a website bonus – like Jenny Crusie did with the Antagonist Monologues on her blog – but for now, I’m going to try to focus on just getting clues about the antag dropped in the MC’s POV pages.